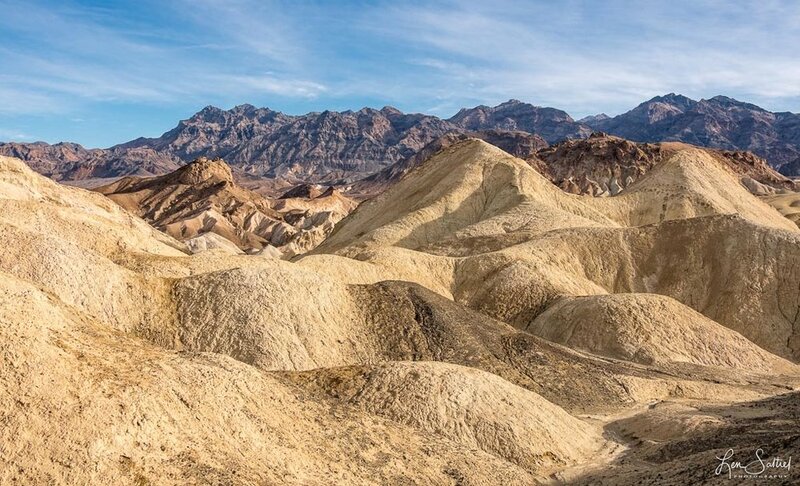 Some the best locations to explore in Death Valley are the many canyons that seem to be just about everywhere. Some are small and narrow, while others are wide enough to have roads. Of all of the canyons that we visited, Twenty Mule Team Canyon was my favorite. Truth be told, it probably was my favorite spot in the park. Twenty Mule Team Canyon is quite large, and viewing it from the ground didn't give me the perspective of the area. Fortunately, the rock formations are climbable if you are in decent shape. So up I went to the top of many of the surrounding formations, some by a trail and others blazing a new trail. When I reached the top to look around, I had a 360-degree view of this section of the canyon. As you can see, the landscape is quite amazing, with small ravines running between the formations. This view looking eastward away from the road shows the incredible formations with the Amargosa Mountain Range as a backdrop.